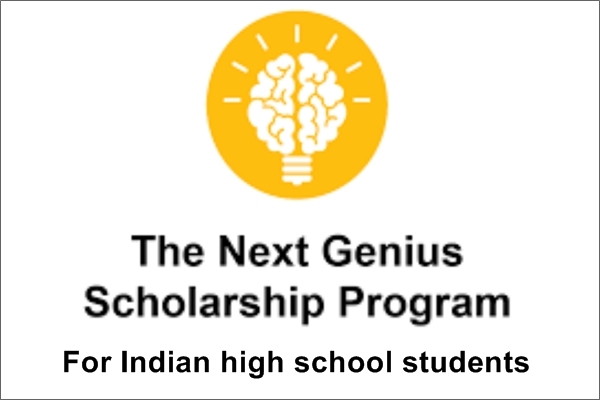 Founded in 2014 by the dynamic father-son duo of Naveen Neeraj Mandhana, Next Genius Foundation is a registered charitable trust in India that offers full and partial tuition scholarships to outstanding Indian high school students to pursue their undergraduate education in the United States.. They follow in the footsteps of the late Shree Bhawarlalji Mandhana, retired Judge, Rajasthan High Court and retired Law Secretary of Rajasthan. The Next Genius Scholarship only covers the actual tuition (fees) component of the undergraduate education. A 100% tuition fees scholarship winner will be provided a full tuition fee waiver for only four years of their undergraduate education. The scholarship does not offer money for actual expenses such as accommodation, food, stationery, insurance & travel. Parents will be made aware that living cost in the US vary according to the location and can range anywhere between USD 10,000 - 20,000 per year. Any non-tuition expenses are the liability of the parents and the student. A partial scholarship winner would be provided a partial-tuition fee waiver for only four years of their undergraduate education. The scholarship does not offer money for actual expenses such as accommodation, food, stationery, insurance & travel. Parents will be made aware that living cost in the US vary according to the location and can range anywhere between USD 10,000 - 20,000 per year. Any non-tuition expenses are the liability of the parents and the student. After creating the account, the applicant should log-in, fill the profile information and attempt a practice test which is in-built on the website. Log-in and solve a 2 hour critical thinking assessment . Top performers in the assessment are shortlisted for next level. Shortlisted students are provided with detailed information about the various scholarships and are invited to identify college(s) of their preference. Candidates submit a complete college application to a college of their choice. Candidates are invited to Mumbai for a personal interview. Scholarships are awarded in a public award ceremony.